Here at QHS we have been working on many interesting projects for Autumn that celebrate the vast collection and resources of the Society. One project I‟m exited to announce is a new display of almost 40 historic images from the QHS collection that are now on permanent display in a new building – the Executive Office Centre at Fresh Meadows. 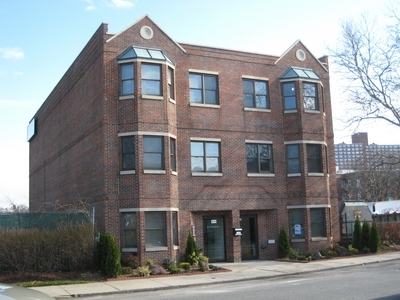 The building, which officially opened on September 1st 2010, is a state of the art office center that offers full service executive suites and virtual office options to businesses looking to rent commercial office space in the borough of Queens or Long Island. The images – which depict life in Queens from the late 19th century through the 20th century – show everything fromthe 7 train construction in Flushing to the Van Siclen Farm in Jamaica Estates, to many images from Fresh Meadows where the office building is located. The Center will be setting up a special event sometime in the Fall for the public to view the collection of images spread through-out the building, including the lobby. There is still office space available for this innovative “shared office environment” that is extremely modern, and yet still celebrates the history of Queens. Mary Abrams, Associate Director at: (718) 475-2121. Past News: It is with great sadness that I announce QHS lost of one its trustees this June-Joseph Hellman joined the Board in 2007. His quiet way attested to a determination that was admired. Some Board members have made contributions to the Society in his name. We extend our deepest condolences to his wife and family. The faces of Flushing did change also. Sailing canoes up and down. Brandishing guns to show their might. Her face took on a different hue. And recorded as property, however few. Valiantly sought freedom time and again. They longed to hear the clang of freedom‟s bell. As they battled for freedom and chose to stand. For you to identify and trace. Portray the history and heritage we celebrate today. “The Faces of Flushing” written by Clara M. Jones appears in her book of poetry HIGHER GROUND Volume II, “Outspoken Words from the Heart” published in October 2006. A new 16 foot LED display now adorns the 11,000 square foot commercial building at the rear of the Fresh Meadows shopping center parking lot. The Tudor style, twin-peaked office building owned by HLB Realty Corp. has been under renovation for the past year, and opened September 1 as the EXECUTIVE OFFICE CENTER At Fresh Meadows. Center directors, Steven and Jack Blumner, may have hit upon a novel idea as they prepare to open their state-of-the-art business center. They won’t merely be landlords. They will be actively working to help their tenants make money. The sign is part of their strategy. The LED sign on the rear of the building facing the busy parking lot will help advertise their new tenants. The two brothers also intend to help market their tenants to the surrounding zip codes by e-mail and direct mail. Steven and Jack Blumner are the former broker/owners of First Choice Real Estate, once the top selling residential firm in Queens. Marketing was instrumental to the success of the company, which was purchased by NRT, Inc. in November, 2004. NRT added the firm to its Coldwell Banker Residential Brokerage group, but the company gave up the Queens location last August, after five years of battling a difficult real estate market. The EXECUTIVE OFFICE CENTER At Fresh Meadows is the first executive suite center to open inQueens. An executive suite center is an office building in which each tenant has an individual office but all share a common receptionist and lobby/waiting area, conference room and kitchen facilities. They are usually fully furnished, telephone and internet-ready, and tenants receive other professional staff support and services from the landlord. The Executive Office Center at Fresh Meadows offers another interesting innovation that is relatively common in Manhattan, but new to Queens – virtual offices. A virtual office allows a company to work off-site while receiving many of the benefits of having an actual office in an office building. “The Long Island accounting firm of KWEIT, MANTEL & DELUCIA has joined us as well. Their business has been growing in spite of an underwhelming economy, and they felt they needed a place on the map between their two main centers of business, Nassau County and Manhattan. We also have been joined by a variety of other companies that will be of great interest to the neighborhood,” said Mr. Blumner. Announcing the Community News Group — New York’s largest collection of family-owned newspapers, websites, and magazines and the city’s most powerful name in community journalism. Our assortment of weekly and bi-weekly newspapers along with websites that are updated several times a day have been bringing neighbors together for more than 80 years. We’ve got our finger on the pulse of our communities, and no one has the attention of New York City’s hippest and most-happening neighborhoods like we do. 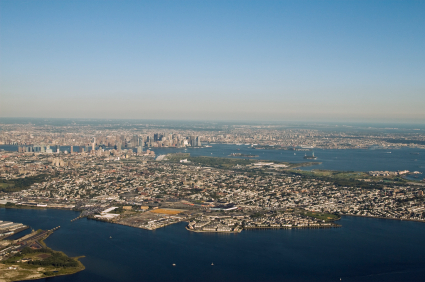 More than 1 million people living in neighborhoods such as the Village, Dumbo, Astoria, Pelham Bay, Sheepshead Bay, Williamsburg, Bayside, Throggs Neck, and many more look to us each month to find out what is happening in and around their homes. We do this as members of our communities. Our staff — from reporters, to editors, to sales reps, to ownership — lives in the communities it covers, so we know what is happening when, where, and why. So look to your local Community News Group newspaper and website for breaking news, analysis, and what’s happening in your area, because there are a million stories in New York City, and we’re covering them one neighborhood at a time. 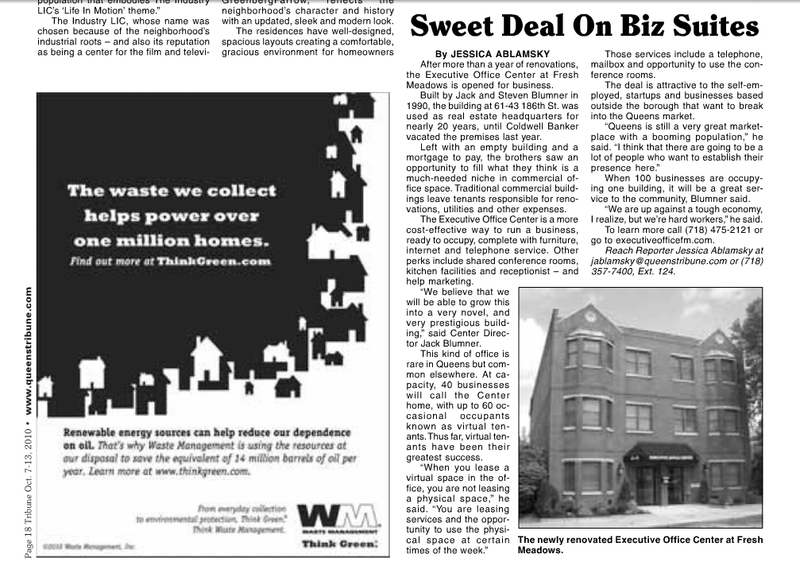 The Queens Courier recently featured a piece on the Executive Office Center at Fresh Meadows. The new office business center has set up their facilities in an existing office building near a local shopping center. The company, owned by Jack and Steven Blummer, will also offer virtual offices. The set-up is an ideal solution for companies and individuals in the Queens area who are looking to save on business expenses. In addition to huge savings in comparison to what would be spent on traditional, costly Manhattan office space, local workers will have the opportunity to improve their productivity by cutting out a long commute and taking advantage of what the business center structure offers – professional support and services, furnished offices, and more. The serviced office and virtual office industry is highly popular in Manhattan and Long Island, but the Executive Office Center at Fresh Meadows is the first significant player in the Queens market, according to the article. The office business center industry continues to enjoy steady growth across the board – from California to the UK to Asia and beyond. “[The executive suites] are ideal for start-up companies and just as suitable for companies that have been forced to scale back their operations until economic conditions improve,” Jack Blummer said. (Queens, NY – December 7, 2009) Business owners today are seeking ways to survive and thrive in today’s challenging economic climate. Two savvy local property owners may have hit on one novel approach to do just that as they prepare to open the Executive Office Center at Fresh Meadows early next year. The Tudor style, twin-peaked office building at the rear of the Fresh Meadows Shopping Center parking lot in Queens, owned by HLB Realty Corp. is presently undergoing a radical transformation. Once the home of First Choice Real Estate, formerly the number one residential real estate company in Queens, and most recently occupied by Coldwell Banker, the 11,000 square foot property will soon will soon emerge from its renovation in the form of state-of-the-art executive suites. An executive suite center, also commonly referred to as a business office center, is an office building in which each tenant has an individual office but all share a common receptionist and lobby/waiting area, conference room and kitchen facilities. They are usually fully furnished, telephone and internet-ready, and tenants receive other professional staff support and services from the landlord. It is the type of building that is common in Manhattan and Long Island but has not yet made a significant entry into Queens until now. “The Executive Office Center at Fresh Meadows offers another interesting innovation for businesses that have been hurt by the recession,” says Jack Blumner – “a virtual office.” A virtual office gives tenants an opportunity to work from home while receiving many of the benefits of having an actual office in an office building. Rents at the building will vary, depending on the size of the office. Rents for virtual offices will range from $99 to $299 per month, depending on the level of service. They are ideal for start-up companies and just as suitable for companies that have been forced to scale back their operations until economic conditions improve. • A prestigious business address close to New York City and other boroughs in one of the most vibrant and resilient business environments in the state. • Courteous reception in our elegant, classically furnished lobby/waiting room. • Handsomely appointed telephone and internet ready offices with brand new furniture. • State-of-the-art communications equipment able to answer calls for outside tenants as if they are in the building – screen them, put them on hold, put them through to the tenant or put them in a voice mail. • Discounted costs for telephone and high speed internet services. • Executive conference room for scheduled meetings and kitchen/lunch room with vending machines and large flat screen TV. • Professional support from a dedicated, experienced staff. • Flexible leasing arrangements – both short and long term available. • Seven day per week security access. • Convenient neighborhood location allows you to avoid the hustle and bustle of a commercial thoroughfare. • Professional, dynamic business environment. 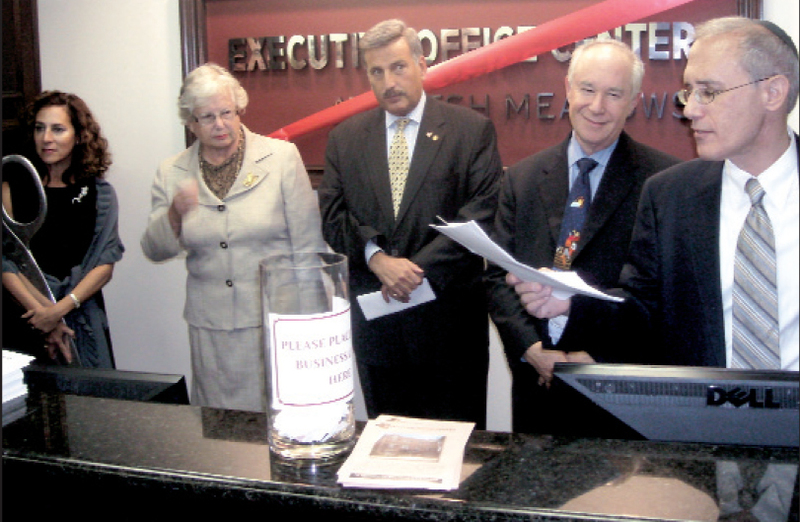 Copyright © Executive Office Center at Fresh Meadows. All Rights Are Reserved.